25 Easy Crock Pot Chicken Recipes for Busy Weeknights are a lifesaver! Never dread hearing “What’s for dinner?” with these chicken recipes in your back pocket! With my family’s busy schedule, getting a homemade dinner on the table every night can be a challenge. 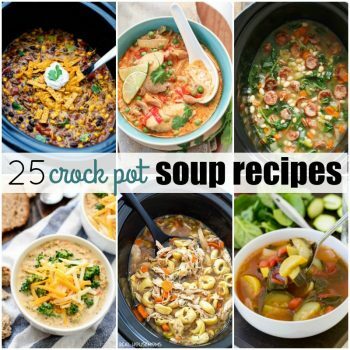 I love these 25 Easy Crock Pot Chicken Recipes during the week! I can buy chicken on sale, freeze until I’m ready, and then throw everything in my slow cooker. Dinner cooks all day and in the evening we have a delicious meal that brings everyone around the dinner table. Most of these dinners are chicken breast crock pot recipes, but you could substitute boneless, skinless thighs to save money too! Like these recipes? 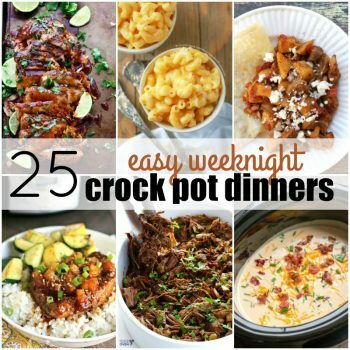 Pin them to your SLOW COOKER pinboard! 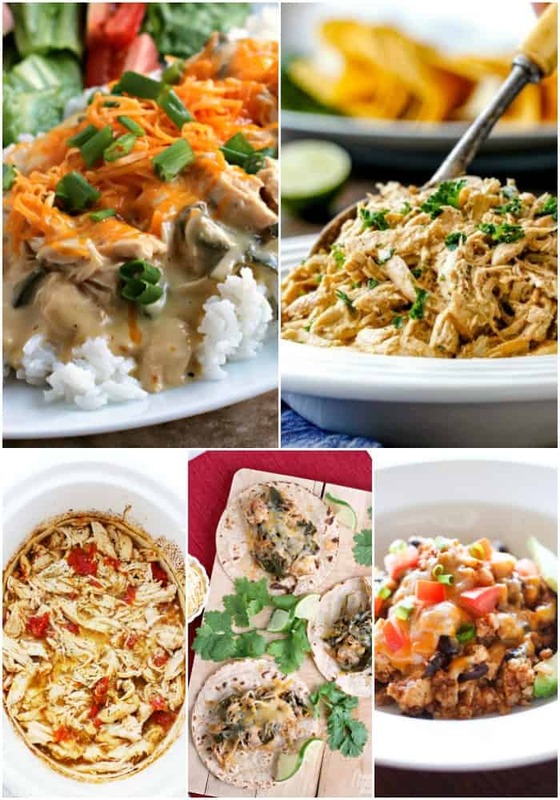 Mexican style chicken crock pot recipes are always a hit at my house. The aromas are amazing and we don’t have to wait in line at our local restaurant! Slow Cooker Poblano Chicken – Creamy and spice, this chicken is great over rice! Slow Cooker Chipotle Ranch Chicken – I love putting this chicken on tostadas, in burritos, and on salads! Easy Crock Pot Salsa Verde Chicken – So much flavor and so easy to make! Slow Cooker Chipotle Chicken & Poblano Street Tacos – One bite of these tacos and you’ll be hooked!! Slow Cooker Chicken Burrito Bowl – An all in one dish that’s sure to satisfy at dinnertime! 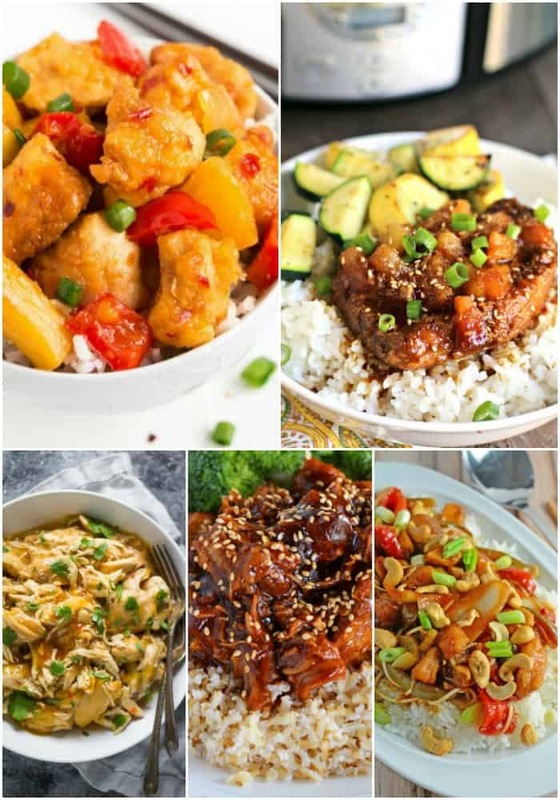 These Asian-inspired chicken crock pot recipes give me all the food cravings! From Chinese to Japanese to Thai, there’s a flavor for everyone! Thai Sweet Chili Chicken – A little heat and a little sweet makes this chicken a favorite at my house! Slow Cooker Pineapple Teriyaki Chicken – I could eat this chicken every week! It’s crazy good and goes great with a bowl of rice and veggies! Slow Cooker Sweet Chili Chicken – This simple recipe is great by itself on a bun, but we really love it in quesadillas! Honey Sesame Crock Pot Chicken – So much flavor in every bite! I would take this chicken over takeout any day! Slow Cooker Cashew Chicken – Who knew Chinese food at home was so easy?! This recipe is a keeper! 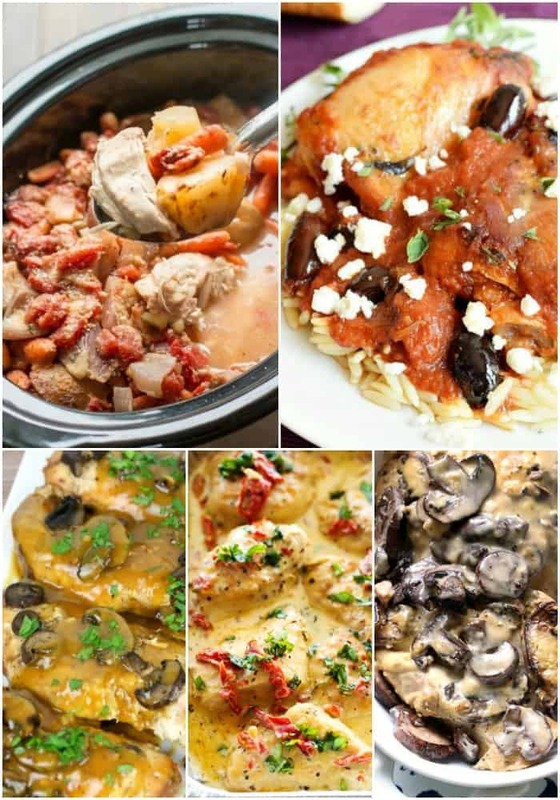 Mediterranean flare has me drooling over these crock pot chicken recipes! These slow cooker spins on traditional Italian and Greek recipes leave my tummy happy! Slow Cooker Italian Chicken Dinner – I love an all-in-one dinner, and this crock pot recipe is one of our favorites! Slow Cooker Mediterranean Chicken – What’s not to love about a flavorful sauce spooned over chicken with fresh Feta and olives?! Slow Cooker Chicken Marsala – Bring home a restaurant favorite the easy way with this crock pot chicken recipe! Slow Cooker Creamy Sun-Dried Tomato Chicken – I get weak in the knees for creamy sauces, chicken, and sun-dried tomatoes! Creamy Portobello Chicken Slow Cooker Recipe – Mushroom lovers will swoon for this easy slow cooker chicken recipe! 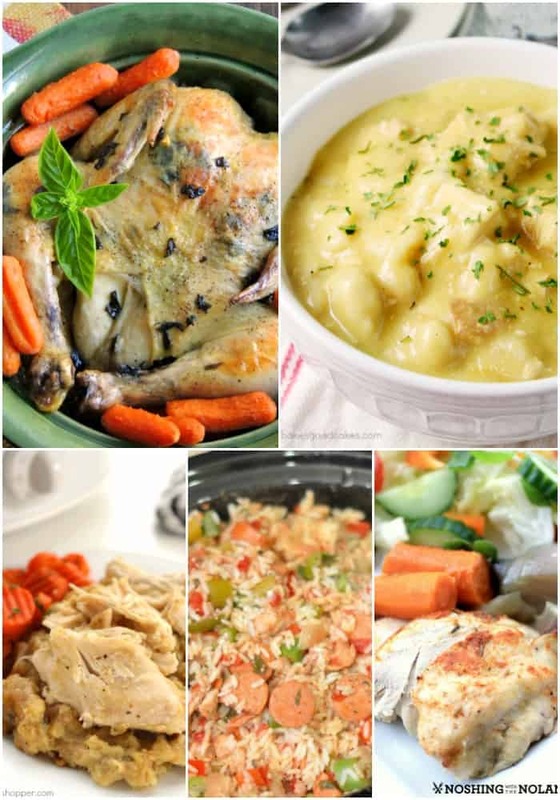 You can’t beat a classic and these tried-and-true crock pot chicken recipes are comfort food favorites everyone loves! Basil & Garlic Slow Cooker Roasted Chicken – I love getting whole chickens on sale at the store and letting my crock pot do the work! Slow Cooker Chicken & Dumplings – This recipe is a big-time comfort food staple for us! Easy Slow Cooker Chicken and Stuffing – Can’t get enough of your favorite Thanksgiving flavors throughout the year? This recipe has got you covered! Slow Cooker Chicken Jambalaya – You don’t have to be creole to love this easy chicken crock pot recipe! Lemon Rosemary Chicken – Lemon and chicken are best friends, and when you some rosemary in…look out! 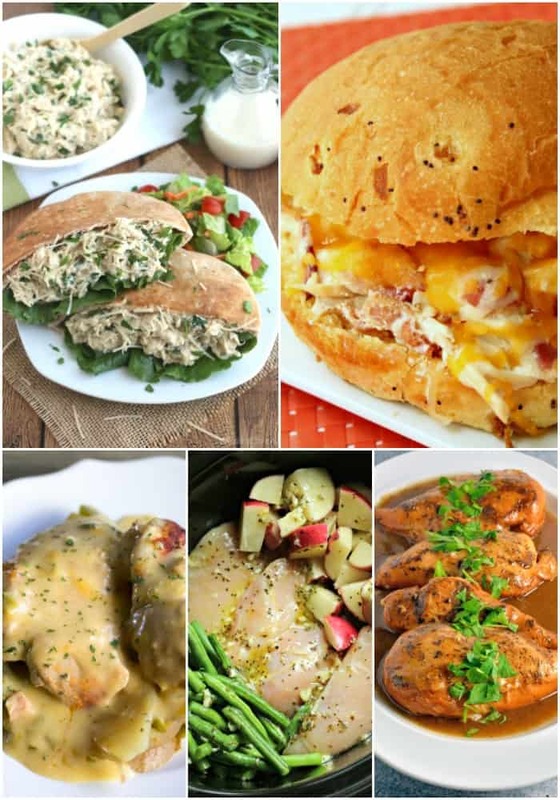 There are so many awesome chicken crock pot recipes to make and these dinners make a regular appearance at my house! Crock Pot Chicken Caesar Sandwiches – I love serving this chicken in pita, tortilla wraps, and even on a bun for lunch or dinner! Slow Cooker Chicken Bacon Ranch Sandwiches – So easy to make and my kids go crazy for ’em! Slow Cooker Cheesy Chicken & Potatoes – Low budget and the cheese sauce just does me in! Seasoned Chicken, Potatoes, and Green Beans – Who doesn’t love a good dump it, set it, and forget it recipe? Slow Cooker Apple Balsamic Chicken – The flavor combination on this chicken is soooo tasty! Serve it with your favorite sides and you’re in business!